WinSesame 11: Data protection with a high level of security. Protect confidential files or folders using strong encryption by password and key file on any media: hard disk, mobile media, network. Creation of self-extracting encrypted archives that do not require the software to be installed. Concealing encrypted data behind photos. Signature and certification of all types of files. Under which version of Windows does WinSesame work? I forgot a password : what can I do? Does the removing of the software remove the protection? Does WinSesame work on a limited account? Which is the security level of WinSesame? Is it possible to schedule the locking of all the opened protected folders? How to no longer protect a folder? How to change the password of a folder? Can I carry a protected folder on my USB key and open it on another computer? If my computer is destroyed my license lost can I recover my protected... ? How can I send protected data to somebody who does not have WinSesame? Does WinSesame work with Linux and Mac? Can I use my license on several computers? What to do if I change computer? Can I lock files on the network? If I open a protected folder on the network can the other users access it ? Which is the maximum size of the folders that WinSesame can protect? Can a folder protected by WinSesame be removed by somebody who can access this file? All the frequently asked questions. How to password protect a folder in windows? USB disk encryption: Set up a secure portable drive. How to encrypt a file in Windows? 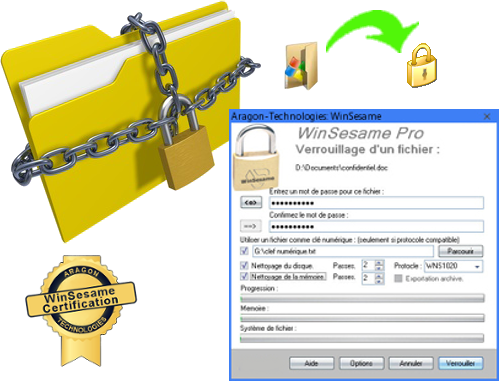 Can a folder protected by WinSesame be deleted by somebody who can access this file? YES : Any person who has the rights of access can remove even a locked WinSesame folder. This is why the folders protected by WinSesame must be safeguarded like the others. Thanks to the high security level of WinSesame the reticence to have redundant safeguards of highly confidential data is removed. With which version of Windows does WinSesame work? If my computer is destroyed my license lost and I cannot contact the supplier of the software to obtain a new license can I recover my protected folders stored in my safeguards? How to protect and encrypt my email client with password? If you do not find answers to your question, please use the contact form.